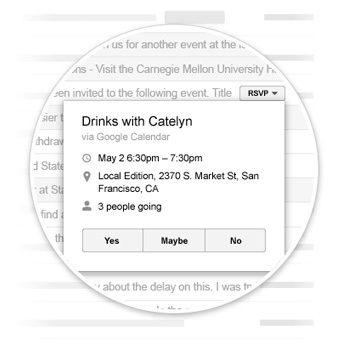 In late May 2013, Gmail introduced the now infamous tabbed inbox—an interface that allows users to enable different tabs for better inbox management. This new inbox is available in Gmail webmail, as well as the Gmail app for iPad, iPhone, and Android 4.0+. The tabbed inbox allows users to automatically sort incoming messages into five categories: Primary, Social, Promotions, Updates, and Forums. However, the tabbed inbox is completely optional and users have the ability to modify, edit or remove tabs in their account settings. Email marketers really freaked out about the tabbed inbox. Since commercial emails are often routed to the Promotions tab, rather than the default Primary tab, many wondered whether their subscribers would ever see their emails. In addition, with the introduction of inbox ads, which are placed above other emails, commercial emails are pushed even further down the inbox. As a result, many retailers sent emails encouraging their Gmail subscribers to move their emails to the Primary tab, rather than the Promotions tab. 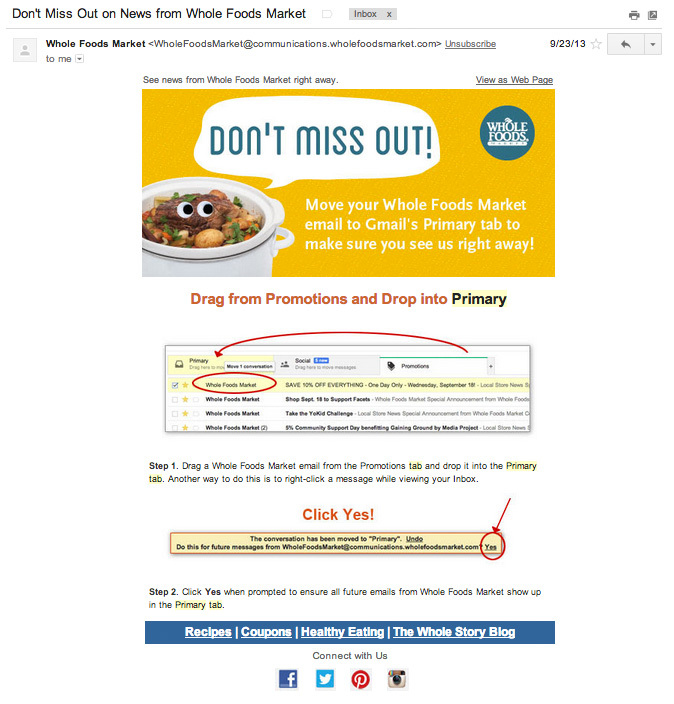 Above is an example of Whole Foods asking subscribers to move their emails to the Primary tab. Was it a valid concern? 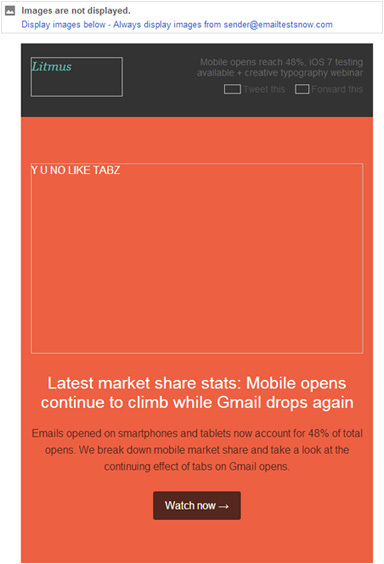 Between the introduction of the tabbed inbox in May and November, Gmail opens decreased 24%. While the roll-out of the tabbed inbox had a negative effect on open rates, there’s evidence that engagement rates increased. Although fewer people may open emails in the Promotions tab, those that do open are more engaged. That’s not a bad thing! Tabs aren’t as big a deal as many email marketers made them out to be. As long as you send relevant content and optimize your from name, subject line, and preheader text, you shouldn’t worry too much about tabs. While we’re still receiving some of those pesky “move us to your Primary tab” emails, we don’t suggest sending them. If your subscribers are engaged with your brand, then they will actively search for your emails (and may even move them to the Primary tab). Wouldn’t you rather send an email with an impactful, relevant CTA than ask your subscribers for a favor? Also, keep in mind that some triggered emails, such as confirmation and welcome messages, do land in the Primary inbox. Use those emails as an opportunity to enforce the value of your email program. With the tabbed inbox it’s more important than ever to only send emails that resonate with your subscribers. Relevancy is crucial! And, as always, be sure your from name, subject line, and preheader text are optimized to encourage opens. In addition, consider longer lead times for your emails. If your subscribers aren’t checking their Promotions tab on a daily basis, then they may miss out on key deals and promotions. Chad White compares the Gmail promotions tab to a shopping mall; saying that consumers visit when they’re ready to buy. We also developed a Which Gmail Tab? tool that lets you send a test email to a real Gmail address—telling you where to expect delivery in a tabs-enabled Gmail account. It’s a quick and easy way to find out where your email will land in the Gmail inbox. In early December 2013, Gmail started caching images for users accessing Gmail via the webmail interface and the mobile Gmail app. When an image is cached, it is downloaded from the original server and stored on a proxy server. Subsequent views of the cached image will always display from the proxy server rather than the original server. Device and browser detection—opens in Gmail webmail will be indistinguishable from opens made on a Gmail mobile app. Geolocation data is lost—it will record the open where Google’s proxy server is located. As a result, Gmail opens made in a browser and on mobile Gmail apps look the same—there’s no way to distinguish webmail from mobile. The silver lining is that open rates for the native email client on Android—which has support for responsive emails—are now more accurate. Another effect of image caching that some Gmail subscribers have noticed lower quality images in their emails due to compression artifacts from the caching process. Above is an example of failed image caching in an email. Unfortunately, some users have even noticed images failing to render at all. Others have reported images loading in the wrong placeholder! Don’t fret! Use individual tracking with Email Analytics to track emails—even in environments where Gmail caches images. While geolocation and some device tracking data is no longer detectable, keep in mind that Gmail accounts for 12% of total opens and only about 20% of those opens occur in the webmail interface. As stated above, if you’re using Email Analytics, be sure to use individual tracking so you can properly track opens. With device tracking information no longer available for Gmail users, it’s essential to test your emails before sending to be sure they look great in all environments. If you previously used geolocation data for targeted emails, you’ll have to try a different strategy for Gmail users. Perhaps consider having users update their location in your subscription center. When it comes to degraded images, images not loading at all, or images loading in the wrong place, there is currently no solution. As a result, now more than ever, it’s important to design your emails for images-off optimization—use ALT text, background colors, and lots of live text—making sure your emails can be understood and enjoyed even if images are not present. Automatic image enablement was introduced shortly after image caching. While Gmail previously blocked images by default, it now automatically displays images (this is, of course, after they’ve been cached and checked for viruses). 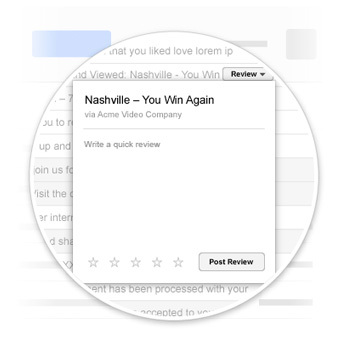 Prior to automatic image enablement, if you weren’t using images-off optimization techniques, like styled ALT text, bulletproof buttons, and background colors, then a large portion of your Gmail subscribers were likely having a poor email experience. Now Gmail users can see the hard work and effort you’ve put into your designs without having to manually enable images! Your messages are now more safe and secure, your images are checked for known viruses or malware, and you’ll never have to press that pesky “display images below” link again. What would you be upset about? This is great news for email designers! Prior to this update, 57% of Gmail users turned images on—which means that a whopping 43% of Gmail users viewed emails with images disabled! Send your emails as you normally do! You’ll have a sense of relief knowing that your Gmail subscribers will, by default, see your design and associated content. However, we still suggest optimizing for images off through the use of bulletproof buttons, ALT text, background colors, and a proper balance of imagery and live text. 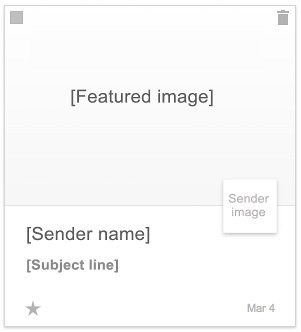 Regardless of whether Gmail may display images by default now, many other clients do not. Also, keep in mind that your open rates may be affected. Email tracking relies on a unique image being included in a campaign and that image being downloaded and displayed within the email. Every time the image is downloaded from the server, the tracking software marks that as an email open. Now that Gmail uses automatic image downloads, these unique “open tracker pixels” will be viewed more often, resulting in increased open rates. How much should you expect your open rates to increase? The number of Gmail users on your list, combined with their preferred email client, will definitely play a factor. 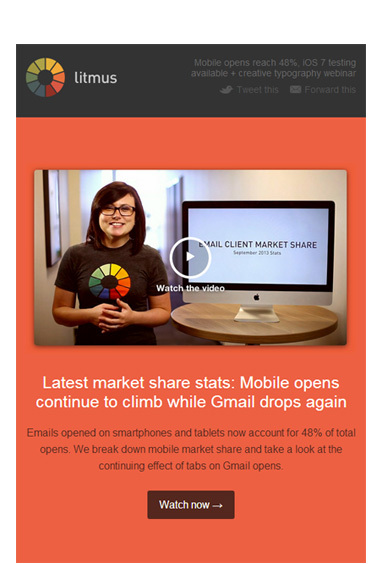 Overall, we’ve seen about a 341% increase in Gmail opens since the introduction of image enablement and image caching! In late February 2014, Gmail made another strive towards simplifying inbox management for their users by introducing automatic unsubscribe. 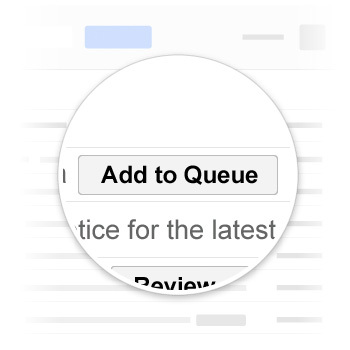 This feature has been rolled out for all users using the Gmail interface. Auto-unsubscribe enables Gmail users to unsubscribe from most promotional mailing lists without having to leave the Gmail interface (just like quick actions!). However, keep in mind that not all promotional emails will have the auto-unsubscribe option—and it relies on certain information being available in the technical headers in your email. Mailing lists may take up to three days to process your unsubscription request, so it may take a few days for you to stop receiving mail from the list. In this case, Gmail is simply passing along the unsubscribe link used by the sender. If clicked, the unsubscribe process will be the same as if they had clicked the unsubscribe link in the body of the email. While auto-unsubscribe makes it easier for subscribers to remove themselves from lists, it may also reduce spam complaints and frustrated users—and may even help improve your sender reputation. Gmail created auto-unsubscribe to benefit both senders and subscribers. By implementing auto-unsubscribe, Gmail allowed disinterested users to unsubscribe from emails quickly and easily. Auto-unsubscribe also decreases the chance of them marking legitimate emails as spam—helping to keep your lists clean and your reputation intact. If numerous people report a sender’s message as spam, then Gmail will classify that sender as a spammer and send their emails to the Spam folder. With the unsubscribe text link, the goal is to decrease subscriber’s spam reports on legitimate promotional emails. The hope is that they will unsubscribe, rather than mark it as spam—which is a major plus for email marketers. Having email recipients unsubscribe from you, rather than mark you as spam, is a huge win for delivery rates! While you may see a rise in unsubscribe rates, this may not be a bad thing. The removal of disengaged and disinterested subscribers from your mailing lists may be beneficial to your overall email marketing program. The unsubscribe button provides an easy way to get consumer feedback and weed out those who aren’t receptive or actively resistant to your message...think about what your subscribers likely did before the new unsubscribe button. Were they more likely to open the email and hunt for the unsubscribe button or just hit spam? The new unsubscribe button is not only a feedback loop, but prevents inboxing issues by reducing reliance on the spam button. Use this feature to your advantage! Having an engaged list and fewer spam reports is definitely good news for email marketers. The auto-unsubscribe feature is only available to senders who are not known spammers, have a positive sending reputation, and include “List-Unsubscribe” in the header. You can choose to use an email address, a URL (perhaps to a subscription center), or both in the list-unsubscribe header. In the example above, both methods are shown. If both an email address and URL are used, the latter of the two will display as the unsubscribe action. And, as always, keep your engagement level up by only sending relevant content to opt-in subscribers! 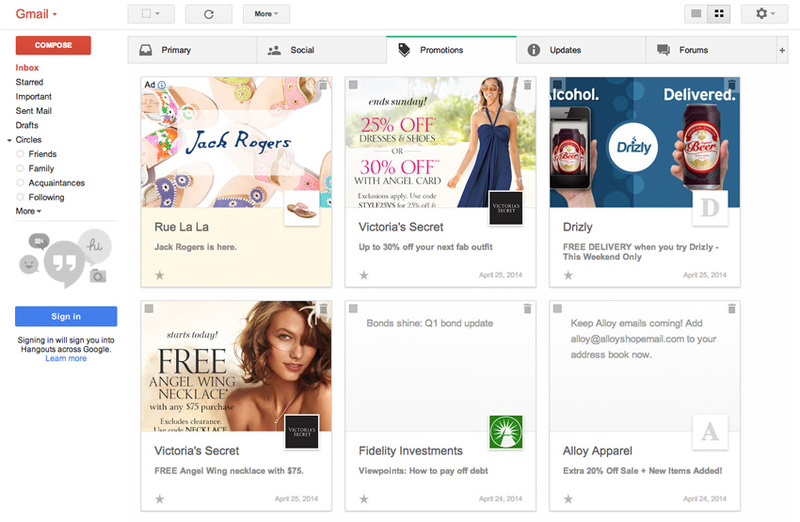 In late March 2014, Gmail introduced a grid-like Promotions tab. 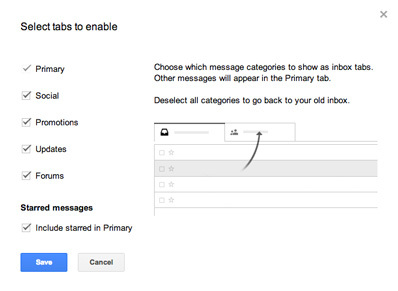 Currently, this new inbox is only available for users that have opted-in and are using the Gmail web interface. There has been no news as of yet on whether it will be implemented for any of their mobile apps. Taking a page out of the Pinterest playbook, Gmail is bringing large graphics and infinite scrolling to the Promotions tab. Talk about a visual inbox! Gmail will now represent each email in the Promotions tab with a large image, displaying messages in a grid format with heavy emphasis on visuals rather than just plain text. The featured image, sender name, subject line, and sender image are crucial to ensuring that your emails look great (note that preheader text is no longer displayed). Ads are also included in the new grid layout and, apart from a small icon in the top-left corner and a different background color, ads look the same as any other email. Kind of sneaky if you ask us! The Vistaprint email on the left is an advertised and promoted email. It’s too soon to tell! Since the Promotions tab grid view is still in a trial phase, it’s likely to only affect Gmail power users and devotees for now. 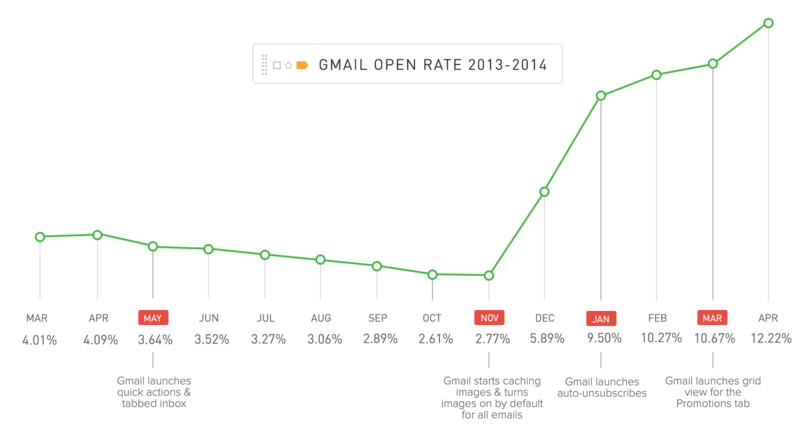 However, if you’re seeing a high percentage of Gmail opens, then it’s definitely something you need to keep in mind. If you have a high percentage of Gmail opens and your emails are going to the Promotions tab (you can use our handy free tool to check out which Gmail tab your emails will appear under), then optimizing for this new grid-like inbox is definitely recommended. To control how your emails show up in this new inbox, you’ll need to implement specific markup—called schemas—into the HTML of your email. We’ve developed a handy (and free!) Gmail Promotion Tab Code Generator to help you create the code you’ll need to add to your HTML email campaigns. For the featured image, you can use GIF, PNG or JPEG images, but animated GIFs will be rendered as static. Additionally, featured images are cached in the same way that Gmail now caches images inside emails. The email on the right is an example of a Promotions tab email that with no image. 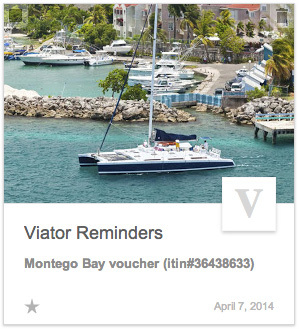 If a featured image is not specified, the end result may be that no image appears for the email in grid view. As seen in the example above, text pulled into the space reserved for the main image doesn’t create an ideal experience. Viator doesn't have a verified Google+ profile, so their sender image defaults to "V."
The sender name and subject line still come from your actual email and, in this new inbox, the sender name will display up to 20 characters while the subject line will display up to 75. The sender image is pulled from your company’s verified Google+ profile. 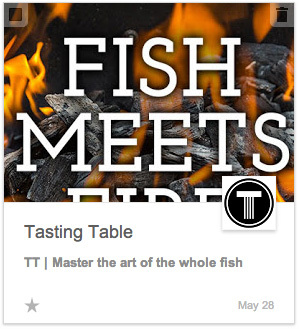 For senders that don’t have a verified Google+ profile (we recommend that you do! ), the logo portion of the message is the first letter of your sender name. For emails that don’t contain the specialized Schema code, Gmail will use an algorithm to determine which image from your email should be featured. While sometimes this algorithm gamble can turn out well, it often generates some undesirable results. 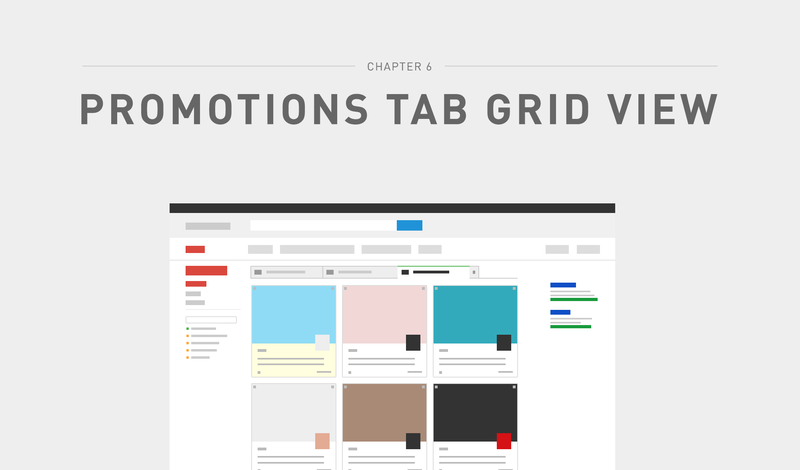 To have a strategic presence in grid view, designing a featured image to represent your message and implement it using Gmail’s code is crucial. Otherwise, you risk showcasing a less-than-desirable image in the inbox. While it’s too soon to say whether open rates will be affected by this new inbox, it definitely makes the inbox a more visual place. Email marketers may be able to use this to their advantage. Email marketers are begging for innovations in email, but complain the minute one comes out. It’s time for us to adapt to change and embrace it. It just so happens that most of Gmail’s updates leave email marketers with plenty of new opportunities. For example, quick actions can help improve your subscriber experience and the tabbed inbox is now giving email marketers even more of a reason to send targeted, relevant emails. In addition, auto-unsubscribes can help improve delivery rates and remove disengaged members from your list. Email marketers need to stop being unnecessarily afraid of unsubscribes! They aren’t always a bad thing—they actually serve as a great feedback loop. Featured images are the first evolutionary thing that’s happened in email in a long time. Through the Promotions tab, Gmail is simplifying and organizing the inbox with an emphasis on visuals. As of yet, no other email clients have been so focused on visuals (we’re anxious to see if other clients and devices will follow suit! ), but it has definitely worked for social media. Email marketers should see what techniques and strategies have worked for marketers in the Pinterest realm and start doing some testing. Featured images have also added a whole other dimension for A/B testing! It all comes down to sending relevant content that your subscribers actually care about and not worrying too much about everything else. 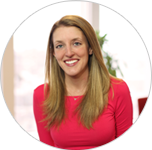 Lauren Smith has her hands involved with all things marketing at Litmus. Whether it’s blogging, tweeting, or helping to plan conferences, she’s always on the look out for anything that will help the world send better emails. 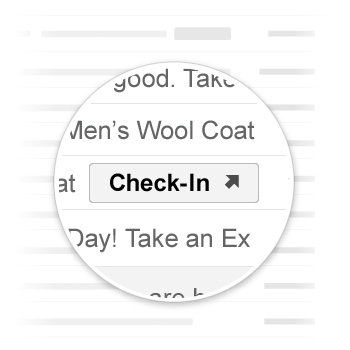 New Gmail Tabs: Big Yawn or Zombie Apocalypse for Email Marketing? 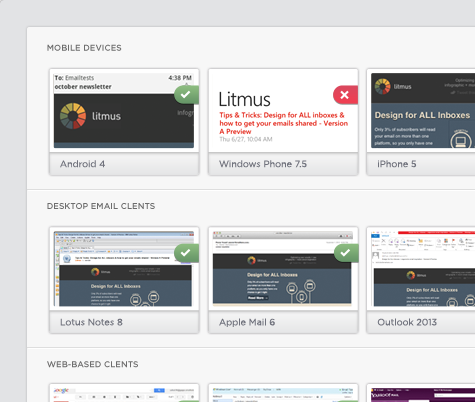 Agencies, designers and marketing teams worldwide use Litmus’ email preview and analytics solutions to test, target and optimize their campaigns.